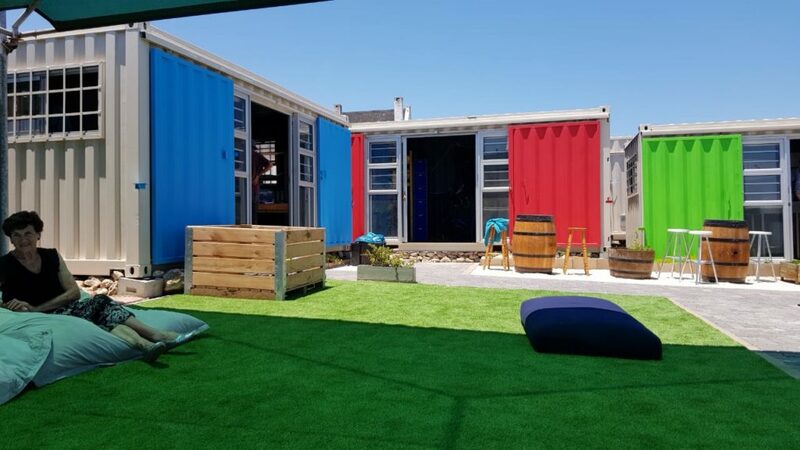 The newly opened Kite Basecamp in Langebaan has proven to be a hit with locals and tourists alike, and the recipe for their success is simple: great location, great coffee and good vibes! The Kite Basecamp is a sort of haven for kitesurfing enthusiasts and amateurs alike. Situated in the boatyard of The Farmhouse Hotel in Langebaan, the basecamp offers the avid kitesurfers of the area a place to chill, chat and re-energise themselves before tackling the waves again. 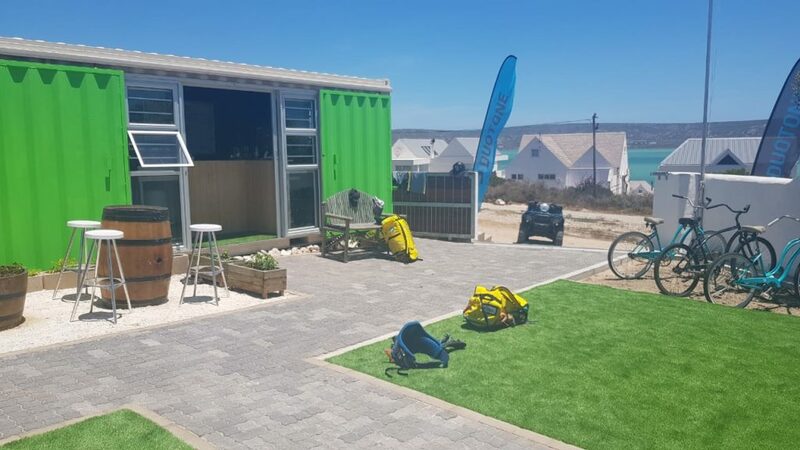 Run by Kiteboarding Collective in conjunction with Village n Life, the Kite Basecamp officially opened on 15 November 2018 – just in time for the flurry of kitesurfers descending upon Langebaan for the summer season. As we’ve said already, the appeal of the Kite Basecamp is simple, and all it offers has proven to be a hit all round. 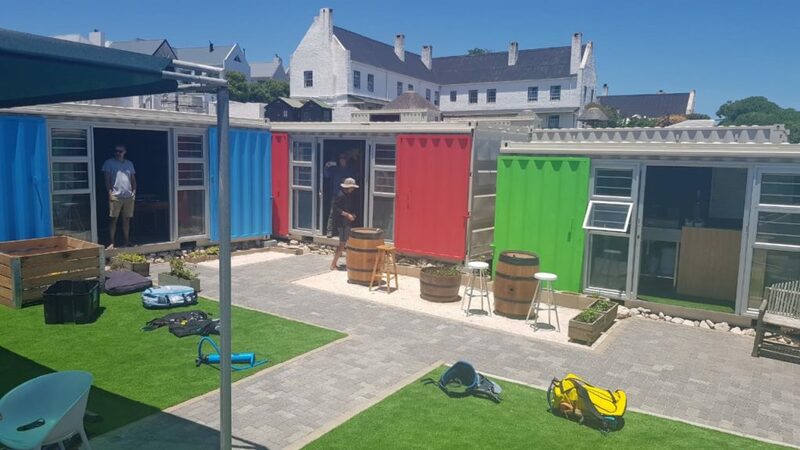 The Kite Basecamp consists of three, repurposed shipping containers that have all been painted bright colours (which, naturally, only adds to the happy-go-lucky vibe of the basecamp). 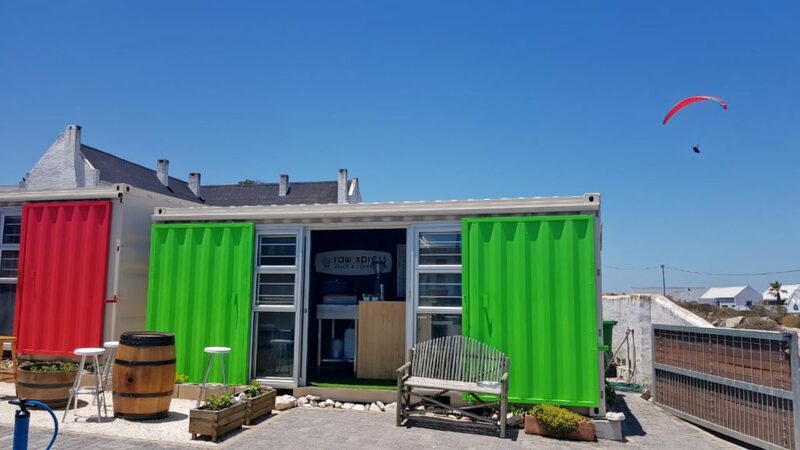 These containers house a raw juice bar and coffee shop – called Raw Xpress – a kite shop and headquarters of Kiteboarding Collective kitesurfing school. At Raw Xpress you can expect delicious, raw, cold-pressed juices that’s sure to get you pumped to take on kiting (whether you’re a professional or amateur!). They also serve locally roasted and freshly brewed coffee in case you needed an extra kick! And If hunger strikes, you can order a yummy, hearty, fresh salad from them. Kite Basecamp also has lots of cool, shaded areas to sit and enjoy your coffee, juice or salad and hang out with other kitesurfers or kiting enthusiasts. Who knows, you may even make a new friend or two! In addition to serving up delicious treats, Kite Basecamp also offers kite, boat and SUP tours, wakeboarding excursions and gear sales. And if you would like to learn this exciting sport, one of the super friendly and experienced instructors will give you a personal, one-on-one kitesurfing lesson. We caught up with Matt Plüg, one of the instructors at the kite school and manager of the Basecamp to tell us a little more about the idea behind the Basecamp and what they have planned for the future. When did you, the Kiteboarding Collective, decide to set up the Kite Basecamp and since when have you been operating the basecamp? We decided to set up and started operating as the Kiteboarding Collective in October 2018. It was incredible to watch the Basecamp grow and evolve over the course of the past season! Our response has been absolutely amazing. The great thing about the Langebaan kiteboarding community and kiteboarding community in general, is that the guys and girls are always keen to get involved with any local business – which in turn helps us grow the industry and excitement for the sport. What makes Langebaan such a cool spot for kitesurfing? Langebaan is an amazing spot to learn how to kite as well as a challenging spot for more advanced riders to practice and progress. We have two beautiful beaches called Shark Bay and Main Beach with different wind effects giving you a versatile learning and kiting experience, Shark Bay being a slightly lighter wind spot which generally blows onshore with shallow and flat water. Main Beach is cross-shore wind which is also slightly stronger than Shark Bay. What are you anticipating for Kite Basecamp in 2019? We have a couple surprises in store for next season, so definitely growth and good things! So, next time you’re in the Langebaan area, make sure to swing past the vibey Kite Basecamp – who knows, you might just pick up a new hobby!